From tuna to billfish and more, these Saltist Lever Drag Single-Speed Conventional Casting Reels are designed for absolute reliability. Spool them up with mono or braid, and there isn’t much they can’t handle. Features include a one-piece aluminum frame and sideplate, helical-cut stainless steel gears, CRBB corrosion-resistant ball bearings, machined-aluminum spool, Ultimate Tournament carbon drag, Infinite Spin freespool, and offset power handle with speed knob. This reel's compact, smooth-casting design offers the ability to toss live bait or artificials with ease. "i got STTLD 40 and its so strong and pretty smooth, i used it for offshore jigging and trolling with excelent results." "This reel is really worth it. There are many things to note about this reel. It's light weight and comfortable in your hand. It's also very sturdy, built to last. The handle is very comfortable." 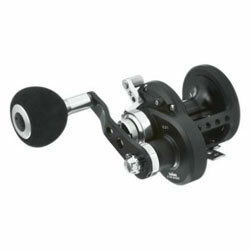 "After discussing reel selection with the pros at the bait shop, I was convinced that the Saltist was the reel for me. Now, I consider myself a Shimano man and still do as about 98% of my reels are Shimano."